It took Andrew Nicholson 37 tries to win Badminton, but today he achieved his goal riding the 17-year old Nereo, defeating defending Badminton champ Michael Jung aboard La Biosthetique Sam FBW. This was Nicholson’s win is his biggest since coming back from neck surgery following a fall in 2015 which nearly paralyzed him. 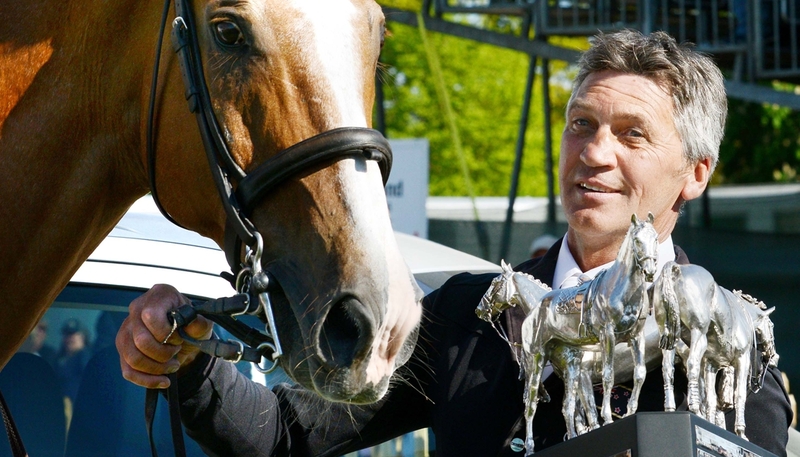 Andrew Nicholson wins Badminton on his 37th attempt. Nicholson rode in his first Badminton in 1984. He’s been second once (2004) and third (2013). In 2013, he and Nero were in the lead after XC but lost in show jumping. Sitting in third place, Nicholson put pressure on Ingrid Klimke and Michael Jung by jumping clear with only 1 time fault. This was quite a feat for Nereo, who is not known for his show jumping prowess.He hasn’t jumped clear in show jumping at the four star level since 2014. But for Nicholson, who has ridden Nereo for 13 years, winning on this horse must be extra special.